Volvo has announced the pricing and specifications for the new XC60. Available to order now, the four-wheel drive crossover will start from £37,205, while top spec models will command £45,600. Deliveries are expected to start in August. The 2017 Volvo XC60 made headlines at the Geneva Motor Show and mirrors much of the styling and tech of its larger sibling, the XC90. However, with prices starting north of £37,000, the new XC60 will cost £4000 more than the model it replaces and go head-to-head with the Audi Q5. 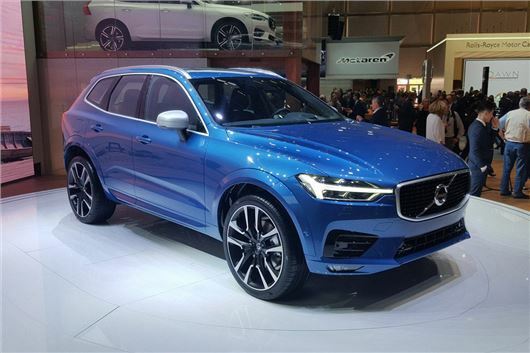 All versions of the 2017 XC60 will get four-wheel drive and an eight-speed automatic gearbox as standard, while the four-cylinder engine line-up will consist of two diesels and a single petrol. A T8 Twin engine petrol-electric plug-in hybrid will most likely be added to the range before the end of 2017. The 2.0-litre D4 diesel is expected to be the biggest-seller, with 190PS and claimed fuel economy peaking at 55.4mpg. The D5 has 235PS and will return an advertised 51.4 mpg, but benefits from PowerPulse which will boosts low-gear performance by blasting compressed air into the engine’s two turbos. The T5 develop 254PS and an official 39.2mpg. There will be three trim levels to choose from and base-spec cars will get leather-faced upholstery, LED headlights, two-zone climate control, a powered tailgate and 18-inch alloy wheels. Volvo's excellent tablet-designed touchscreen infotainment will also be standard, with the nine-inch display providing easy access to navigation, DAB audio and downloadable apps. Like the XC90 and V90, the new XC60 gets a wealth of safety tech. This includes automatic emergency braking and steer assist, which is designed to limit the severity of collisions at low speeds by assisting with the steering in an emergency, such as when swerving to miss an obstacle. Pilot Assist, Volvo’s semi-autonomous drive feature, will be an optional extra and assist with the steering at motorway speeds. It will also take care of the acceleration and braking required to keep the car within lane markings and at the desired cruising speed or distance from any vehicle in front. That's a lot of money - has anyone else noticed the phenomenal increase in car prices over the past few years (especially when a model is replaced or face-lifted)? I thought this model started out as a VW Tiguan / Nissan Qashqai rival - not any more! I don't know how so many people can afford new cars these days - even superminis - maybe they've been taken in by finance deals and are treating car ownership like a mortgage, i.e. only concentrating on the monthly cost rather than the eye-watering total bottom-line price. Do you know the amount of torque, Kerb weight, Nose weight and Maximum Towing weight (for caravan towing) of the XC60 Momentum Pro 254bhp Petrol.